We must first apologise for not putting pen to paper (so to speak) and keeping you updated with the amazing things that continue to happen as we make a difference in children’s lives. We have been updating our Facebook Page regularly, all 292 subscribers … but have neglected our email supporters – until now. Our Garden to Table kids entered the Langham Hotel Cooking Competition and won first prize with their Filo Vegetable Pie. As a result the Head Chef from the Langham Hotel came to our school and put on a “High Tea” for the winning team. A real treat! We put on a ‘Boil Up’ during the first term school holidays with over 100 children attending. Thanks so much to New World Southmall for your support. Rotary Epsom confirmed again that they would sponsor the Sports Academy and one of their members personally sponsored the purchase and screen printing of Canterbury Jackets for all 31 Sports Academy children. There has been a change in ownership of New World Southmall, current sponsor of our Randwick Park Food Bank. The new owner has confirmed his continued support while the previous owner,who has taken over New World Eastridge, has committed to supporting our Glen Innes Foodbank. The ANZ Bank supplied a grant for fruit trees to be planted at Randwick Park School. In February we purchased approximately 50 mature trees and planted them with the assistance of the pupils and teachers. Trillian Trust has sponsored Canterbury Rugby Jerseys for Randwick Park School which will be owned by our own Trust but given to the rugby team when they play. Our boys will be the most professional looking kids on the paddock …. watch this space for results. From the last term of 2013 Breakfast Club began supporting Glen Innes School along with the support of St Kentigern College, Glendowie College and Rotary East. The Principal of this school reported early this year that his Senior School has increased their attendance from around 80% to now almost 95%, with the Breakfast Club initiatives being the main change within the school. Between 50 and 85 children a day are attending Breakfast Club within a school roll of just over 200. The success of the Christmas Banquet has resulted in a close relationship with both Austin Catering and Gatting Catering. On a number of occasions large quantities of food have been delivered to the school by both of these companies with a value in the $1,000’s. Students from St Kentigern and Glendowie Colleges attend each Wednesday and Thursday to help out at both the Breakfast Club and one on one reading. Each week 50 students from Glen Innes School have been transported to St Kentigern College (free of charge) to undertake various sporting activities. We are currently in discussions with Rotary East about financially supporting Sporting and Garden to Table Projects in 2015. To date we have had very favourable responses from them. 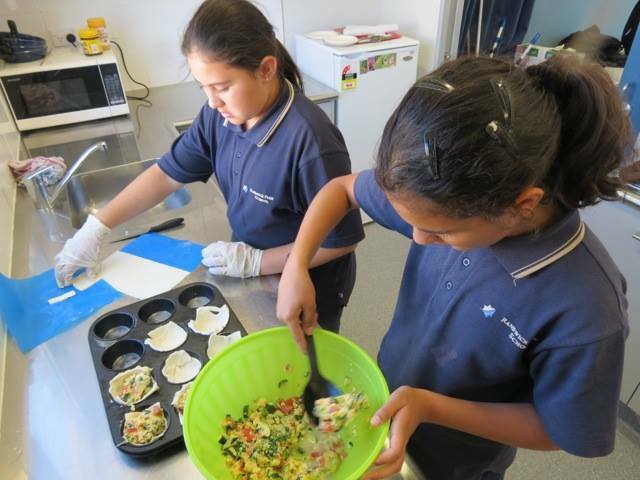 Bayfield School (Herne Bay) are still delivering to us each term about $3,000 worth of food. This now goes to the Glen Innes School Food Bank. In addition, Kensington Swan Lawyers supplied about $2,000 worth of canned food this term to the Glen Innes School Food Bank. With the Sponsorship of Gattings Catering and St Ignatius Church (St Heliers Bay), this term we commenced Breakfast Club at St Pius X School. Discussions are also underway on the options of starting a Garden to Table Programme and Sports Support. As both St Pius X and Glen Innes School share their ‘Social Worker’ we also share the Food Bank at Glen Innes School. We have had discussions with The Storage King in Glen Innes who have kindly donated to us a Storage Unit for our Food Bank.